El vino, de plátano; y si sale agrio, ¡es nuestro vino! Over thirty years of political migration brought close to a million Cuban immigrants to American soil, harboring distinct waves of immigrants as well as distinct refugee “vintages,” alike only in their final rejection of Cuba. Each of the major waves of migration has been characterized by a very different social composition. To understand the changing characteristics of the exiles over time, we need to pay attention to the changing phases of the Cuban revolution. As Peter Rose (1981, p. 11) underlined, “refugees do not live in a vacuum. They are part of an intricate sociopolitical web that must be seen as the background against which any portrait of their travails must be painted and any dissection of their innermost thoughts and feelings must be pinned.” This analysis focuses both on the nature of the decisions the refugees made to leave Cuba and the larger social structures that shaped the exodus. As C. Wright Mills (1961) said, so long ago, the sociological imagination lies at the intersection of personal troubles and historical issues. Including those who were born here, the total number of Cubans in the United States as of 1990 was approximately 1,042,433, 73 percent of which were immigrants. 2 The 1990 census data gives us, for the first time, the opportunity to look at the social and demographic characteristics of the distinct waves of the Cuban exodus. 3 The various waves of Cuban migration brought very different sets of social resources with them— such as their social class, race, education, family, institutional knowledge, and values. Over the course of more than 30 years of exodus, they also arrived in the U. S. at times when the social context that greeted them presented them with vastly different amounts of opportunity— such as economic growth or recession, government policy programs, a warm welcome or cold reception. Hence, Cuban immigrants from the various waves of migration have undergone rather different processes of incorporation into American society, as will be seen in their contrasting social outcomes. As a result, to portray Cubans in the United States by figures that describe them as a whole (e.g., by their overall education or poverty level) masks the vastly different social realities which they represent. Those many social realities are the result of their manifold migrations. It is the reluctance to uproot oneself, and the absence of positive original motivations to settle elsewhere, which characterizes all refugee decisions and distinguishes the refugee from the voluntary migrants (1973, p. 130). Hence, the key idea necessary to understand the refugee in flight is that of the “push” (cf. Lee 1966). While ordinary immigrants are more likely to be “pulled” by the attraction of the opportunity to fashion a better life, as Barry Stein (1981, p. 322) succinctly expressed it, “the refugee is not pulled out; he is pushed out. Given the choice, he would stay.” Political exile is the last step of a process of profound political disaffection that, as Kunz (1973) stressed, is often accompanied by the refugees’ fear for their safety given their interpretation of events and self perceived danger. As the political situation ripens for each, they will leave the country as distinct ‘vintages’ each usually convinced of the moral and political rightness of his actions and implicitly or openly blaming those who departed earlier or stayed on (1973, p. 137). Nelson Amaro and Alejandro Portes (1972) portrayed the different phases of the Cuban political immigration as changing over time with the exiles’ principal motivation for their decision to leave. With the unfolding of the Cuban revolution, over the years “those who wait” gave way to “those who escape,” and they to “those who search.” Bringing the analysis up to date, I have added “those who hope” and “those who despair.” Overall, the Cuban migration is characterized by an inverse relation between date of departure and social class of the immigrants. Typical of the first phase of the immigration were “those who wait.” The Cuban exodus began with the triumph of the Cuban revolution in 1959 over the tyranny of Fulgencio Batista with the exit of the Batistianos. But at this time the majority of Cubans shared in the euphoria of the revolution’s hard-won success. It was only when the revolution entered a more radical phase that the exodus of political immigrants really took force. These executive and owners of firms, big merchants, sugar mill owners, manufacturers, cattlemen, representatives of foreign companies and established professionals, were those most acquainted with the United States’ political and economic guardianship of Cuba, under which they had created or maintained their position, and thus were the least given to believe that the American government would permit the consolidation of a socialist regime in the island (1972, p. 10). I finally broke with my father when I went to college. I elected to go to Yale and not to Salamanca, where my father wanted me to go. I wanted to be an American very badly. I became an American aspirant. The United States had just emerged victorious from World War II. I was away at Yale then. Four years later I returned to Cuba, went to work for a leading American company, bought a house in the Marianao suburbs —the whole thing. Fidel turned me back into a Cuban (Llanes 1982, pp. 53-54). “Those who wait” characterizes those first refugees that came imagining that exile would be temporary, waiting for the inevitable American reaction and help to overthrow Cuba’s new government. In this first stage the exile’s political activity was intensely militant, supporting military counterrevolution against Cuba. Of these, the exiles’ invasion of Bay of Pigs in April 1961 was the largest and most tragic. This first phase of the Cuban exile ended with the fiasco of the Freedom Fighters’ attempt to liberate Cuba from Castro’s hold. In Playa Girón the 2506 Brigade fought against the Cuban rebel army, waiting for the air cover the United States had promised. They waited in vain (see Thomas 1977). “Those who escape” constituted the second phase that was set on by the growing political turmoil when the Catholic church was silenced after denouncing the communist direction the revolution was taking (cf. Alfonso 1984); the electoral system collapsed when the jubilant crowds chanted around Castro “¿Elecciones para qué?” (“What do we need elections for?”); and Castro announced that he had always been a Marxist-Leninist and would be so until the day he died (cf. Thomas 1977). The exodus doubled. As Amaro and Portes noted, the inverse relationship between date of emigration and social class in Cuba began to show. Still largely a middle-class exodus, now it was more middle than upper: middle merchants and middle management, landlords, middle-level professionals, and a considerable number of skilled unionized workers, who wanted to escape an intolerable new order. We became aware gradually of the shift in Fidel’s policies to the left, but papi didn’t want to leave Havana … My mother, on the other hand, was panicked. What will they do to the children in school? Will they force them to go to communist schools? Finally in August we left (Llanes 1982, pp. 23-24). Over 14,000 children came alone through Operation Peter Pan, sent by their frightened parents (Walsh 1971). “What began as a trickle,” wrote Richard Fagen et al. (1968, p. 62), “was, by the middle of 1962, a small flood.” Data from the 1990 census show that of the 757,187 Cubans in the United States who immigrated after the revolution, 25 percent arrived during the first wave, 1960-1964 5 (see Table 1). At this time the Cuban Refugee Program was initiated that assisted most of the refugees in Miami. The higher class origin of these Cuban refugees has been well documented. This initial exodus over represented the professional, managerial, and middle classes, 31 percent, as well as the clerical and sales workers, 33 percent. Likewise, the educational level of these refugees was remarkably high (Fagen et al. 1968, Table 7.1). Casal (1979) observed that although the “highly belligerent” counterrevolutionary movements of the first two phases never actively engaged all exiles, they did draw on the financial or moral support of most exiles who hoped for Castro’s overthrow and for their own return to Cuba. Unable to reach their goal, the Cuban communities became disenchanted with such activities and withdrew their support. As Kunz (1973, p. 133) specified, when refugees realize “that the doors are closed behind” them, they begin to take the steps that change them from temporary refugees into exiles. Kunz (1981, pp. 45-46) also distinguished various refugee types according to their ideologicalnational orientation while in exile. Kunz’s labels for the various ways in which one can be an exile constitute an effort to delineate the types: the Restoration Activists, the Passive Hurt, the Integration Realists, the Eager Assimilationists, the Revolutionary Activists, and the Founders of Utopias. Revolutionary Activists singlemindedly “subjugate matters of family and chances of long term resettlement” to the purposes they set out to achieve, while Eager Assimilationists may engage in a “hyperactive search for assimilation and the achievement of material success” as a way to forget their guilt and their past. Still, it is important to realize, as Kunz proposed, that while these “solutions” to the problem of exile may be found side by side, most individuals “pass through these role-phases from their day of flight, progressing and regressing” throughout their exile careers (Kunz 1981, p. 46), passages that may well be facilitated by specific events. The very life of Lourdes Casal attests to various exile role passages and to diametrically opposed ways of shouldering the felt sense of historic responsibility which exile can entail. In her attempt to express her strong identification with Cuba and to solve her personal problem of exile, Lourdes Casal lived through many exile lives. Casal was a formidable woman: a Black Cuban from the middle class, in the early seventies she was the founder of the magazine Areíto and the Antonio Maceo Brigade, for Cuban-Americans open to or in sympathy with the revolution. Yet at the beginning of the revolution, in the late fifties and early sixties, she had been an active member of groups, such as the Juventud Universitaria Católica (Catholic University Students) and the Directorio Revolucionario Estudiantil (Students’ Revolutionary Directorate), that fought against Batista’s dictatorship but also actively opposed the communist direction in which the revolution was then headed. As a result of her travels to Africa and her return to Cuba, as well as the social movements then rippling through the United States, she underwent a profound personal change and, in the early seventies, became an active supporter of the Cuban revolution. When she learned that she had little time left to live, she chose to return and, in 1981, died in Cuba, where she is buried (see Institute of Cuban Studies 1982). As Peter Rose (1981, p. 11) highlighted, few social scientists have turned their attention to the sociology of exile, and even those few “rarely have delved into the social and psychological ramifications of those affected” by refugee migration and resettlement. After the October Missile Crisis in 1962, the flights ceased, forcing the migration rate to slow down. The U.S. provided direct transportation only for over 1,000 Cuban exiles that had been imprisoned in Cuba as a result of the Bay of Pigs fiasco and their relatives. The Cuban government exchanged the prisoners for vital needs: medicine, medical and surgical equipment, food, and money. Some of the people who left from Mariel (in 1980) took twenty hours to cross the distance in a motorboat. We took twenty days in 1962, my family and me, in a boat with three oars and holes….You tell me how eight people could leave on an eight-foot rowboat and expect to get anywhere. Across the Miami Causeway maybe, but not those stinking, treacherous ninety miles. God was with us. There is no other answer (Llanes 1982, p. 19). During this phase of the exodus, close to half of the arrivals were blue-collar workers, skilled and unskilled, and a large proportion were agricultural workers and fishermen (Casal 1979, Table 1). Cuba introduced food rationing and compulsory military service at this time, further spurring the exodus. In the Fall of 1965 a chaotic period ensued when hundreds of boats left from Miami for the Cuban port of Camarioca, where they picked up thousands of relatives to come to the United States. “Those who search” characterized this next major wave of the Cuban migration. In response to President Lyndon Johnson’s “open door” policy that welcomed refugees from communism, the Cuban exodus was organized and concerted. For eight years, the United States and Cuban governments administered an orderly air bridge as the Vuelos de la Libertad, or Freedom Flights, daily brought Cubans from Varadero to Miami that the Cuban Refugee Program swiftly processed and resettled, dispersing them throughout the United States. Kunz (1973) distinguished anticipatory refugee movements from acute ones. The joint policy of the Unites States and Cuban governments turned this initially acute exodus into a coordinated and orderly anticipatory refugee movement. Though for quite different reasons, the U. S. and Cuban governments have often “cooperated with the enemy,” as Jorge Domínguez (1991) stressed. When the refugee airlift closed, thousands of flights had brought more than a quarter of a million persons. 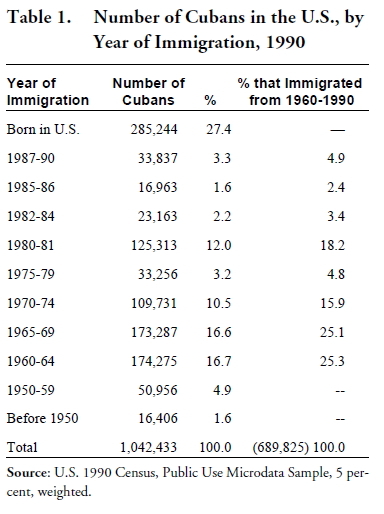 As Table 1 shows, 41 percent of Cubans who immigrated to the United States after the revolution came over during the years of the airbridge: 1965-1974. Throughout this period, the Memorandum of Understanding regulated the immigrants’ departure, giving the immediate family of exiles already living in the United States priority (Thomas 1967). Both countries compiled their “master lists” – one composed in the U. S. of those who claimed their relatives in Cuba, and one composed in Cuba of those who requested departure. Jointly, both governments decided who would emigrate and the migration proceeded through family networks. Cuba barred from exit young men of military service age, as well as professionals, technical, and skilled workers whose exit would cause a serious disturbance in production or delivering social services, such as doctors (Clark 1975). With this phase of the migration, the exodus of the upper and upper-middle classes largely came to an end. This wave of immigration was largely working class and “petite bourgeoisie”: employees, independent craftsmen, small merchants, skilled and semi-skilled workers. Amaro and Portes judged (1972, p. 13) that over time the political exile increasingly became an economic exile as “those who search” searched for greater economic opportunities than were provided in a socialist society that instituted a new ethic of sacrificing individual consumption to achieve collective goals. We had applied for an exit permit. This meant that I would lose my job at the newspaper. We had planned for a few months of unemployment. It was unavoidable… Then, slam…The door closed and I was inside. Unemployed. We finally left in 1966. Can you imagine that? Four years knocking around doing “volunteer work” on weekends in order to get the food allowance. We lost our belongings. Everything we owned was sold or traded for food. We ended up living with my friend Jacobo, who took us in at great risk. I lost eighty pounds in those four years (Llanes 1982, pp. 93-94). The social transformations the Cuban revolution effected— political and economic— were so pervasive that they always “pushed” Cubans. America, in facilitating the migration, always “pulled” them. Moreover, the Cuban migration is unique in the extent to which both the United States and Cuban governments organized, concerted, and facilitated the exodus (Tabori 1972). Together, I argued, they set in motion a system of political migration that for many years proved beneficial to both. The loss of the educated, professional middle classes indeed proved erosive to the Cuban revolution, but it also served the positive function of externalizing dissent. At the same time, in the United States the arrival of so many refugees who “voted with their feet” also served to provide the legitimacy necessary for foreign policy actions during the tense years of the Cold War (Pedraza-Bailey 1985). Now the Cuban community in the United States became increasingly heterogeneous, varying widely in their social class origin. The former social distinctions were perpetrated and reenacted in exile, often with little bearing to their life in America. Those who had belonged to the five most exclusive yacht and country clubs in Havana founded another in Miami, with nostalgia dubbed “The Big Five.” Cubans of working-class origin remain outsiders to these attempts to recreate a golden past that seems to ever grow only more golden. When the migration began in the early 1960s, 31 percent of the Cubans who arrived in the Unites States were professionals or managers. By 1970, only 12 percent were professionals or managers. More than half the arrivals, 57 percent, were blue-collar, service, or agricultural workers (Aguirre 1976, Table 2). While Cuban exiles are clearly heterogeneous, their celebrated “success story” obscures it. It particularly serves to obscure the many Cuban poor. Still, the Cuban poor have always been evident in many neighborhoods of la Southwestcera, as Miami’s Southwest is affectionately called. But not only are they hidden from the view of Americans, Cubans also tend to hide them from themselves (cf. Domínguez 1975). Casal (1979, p. 116) emphasized the costs of the “success story”: it prevents Cubans from getting “a clear picture” of their true situation; it desensitizes them and others to the hidden costs of “success;” and it isolates Cubans from other American minorities. Cuban immigrants that arrived after the airbridge ended consisted of refugees that had first lived in Spain. Portes, Clark, and Bach (1977) found that these émigrés represented Cuba’s “middling service sectors:” cooks, gardeners, domestics, street vendors, shoe shiners, barbers, hairdressers, taxi drivers, small retail merchants. They had left Cuba during the period when Castro launched a new “revolutionary offensive” in Cuba, confiscating over 55,000 small businesses that were still privately owned (Mesa-Lago 1978), “pushing” out the little entrepreneur and his employees. By and large, the refugees of this “vintage” believed in the promises of the revolution until the Cuban government labelled them parásitos, or “parasites,” and took over their small businesses. With the economic transition to socialism effected, in the seventies the Cuban government cast the shape of the political system: the new Cuban Communist Party held its First Congress; a new Constitution was declared; and Fidel Castro formally became President. In many ways, the old idealism and romanticism of the 1960s gave way to what Mesa-Lago (1978) called pragmatism. The failure of the mobilization of hundreds of thousands of Cubans all over the island to make the national goal of cutting 10 million tons of sugar in 1970 issued this new phase. Cuba reintroduced material incentives and wage differentials to promote greater economic growth; other mass organizations, such as the Poder Popular, or Organs of Peoples Power, took form. With this institutionalization, Cuba increasingly took on the features of Eastern European communism (cf. Roca 1977). Among other splits, such as social class and waves of migration, the Cuban community is certainly cleft by age, by generations. Typically, immigrants experience a pronounced generation gap when parents raised in the Old World confront their children raised in the New. But this gap reflects more than that; it is the difference between political generations that result from sharing a common location in a historical social process that subjected them to specific experiences during their youth — a stratification of experience that shapes a frame of reference for the future (Mannheim 1952). Among Cuban exiles, the gap between the political generations which came of age during certain critical periods of Cuban history (cf. Zeitlin 1966), and that which came of age, American, under the impact of the Civil Rights and anti-Vietnam War movements, is often a chasm. It was 55 progressive young people that, in December 1977, first broke through 19 years of hostility, abuse, and isolation. Grouped as the Antonio Maceo Brigade, their visit throughout the island left behind a profound mark. Cuba filmed it: 55 Hermanos (55 Brothers and Sisters) captured their search for cultural identity; for some, for political identity. Widely shown in Cuba, it proved heartrending: evidence of the suffering that exile had brought both those who left and who were left behind.In 1978, a Dialogue took place between the Cuban government and representatives of the Cuban community in exile as a result of which the Cuban government agreed to the release of political prisoners; to promote the reunification of families rent apart by the exodus; and to allow Cubans in the United States to visit their family and their homeland. All at once, the counterrevolutionaries, gusanos of yesterday, respectfully became “members of the Cuban community abroad,” the release of political prisoners began, and the return visits of Cuban exiles commenced. The Cuban community split into the opposing camps of those who supported and opposed the Dialogue; those who returned and refused to visit Cuba. Still, since that day, hundreds of thousands of Cubans have returned to Cuba every year -seeking the family they loved and the vestiges of the life they once led. Since the flow of Cuban refugees had halted for many years, few expected the chaotic flotilla exodus in 1980. Initiated in April by those who asked for political asylum at the Peruvian Embassy, within days it grew massive. When this acute refugee exodus ceased the following Fall, it had brought over 125,000 more Cubans to America, approximately 18 percent of all Cuban immigrants (see Table 1). This wave lacked order and process. From Miami, thousands of boats manned by relatives sped across the 90 miles of sea to Cuba’s Mariel Harbor. At times they succeeded in bringing their families, other times they brought whomever angry officials put on the boats. Towards the end, this included Cuba’s social undesirables: those who had been in prisons (whether they had committed real crimes or had only succeeded in challenging the state), mental patients, and homosexuals. In Cuba, these “antisocial elements”, this escoria, or “scum,” as the government called them, represented a large public slap in the face: no longer the immigrants of the transition from capitalism to communism, but the children of communism itself. In America they arrived in the throes of President Jimmy Carter’s ambivalent government policy that both welcomed them “with open hearts and open arms” and sought to delimit the flow. In the United States, after twenty years of celebrating the achievements of Cuban exiles, the press contributed to their damaging portrayal. It focused on the criminals, the homosexuals, the many Blacks: categories of people to whom Americans accord too little respect. Who were the Marielitos? Were they “scum”? To dispel the more damaging and inaccurate portrayals, Robert Bach (1980; Bach et al. 1981/82) studied their characteristics, sampling the Marielitos soon after their arrival, while they were still in the processing centers and the refugee camps. Among the most salient was their youth (most were young men single or without their families) and the visibly higher proportion of Blacks than ever (Bach et al. 1981/82, pp. 33-35). Their former occupations showed that most were from the mainstream of the Cuban economy, hardly scum. Also salient was their overwhelmingly working class origins — close to 71 percent were blue-collar workers. Mechanics, heavy equipment and factory machine operatives, carpenters, masons, and bus, taxi, and truck drivers led the list of occupations (Bach et al. 1981/82, p. 34). These characteristics, stressed Fernández (1982), suggested new generational strains may have developed from the more limited economic and political opportunities available to the young when the older generation of Cubans who made the revolution held the key posts, as well as the burden of military service in Cuba and overseas shouldered by the young (cf. Díaz-Briquets 1983). “Those who hope” might well characterize this wave. In the United Sates, the press focused inordinately on the criminal element. Indeed, there were many who had been in prison. According to the the Immigration and Naturalization Service, of the 124,789 Mariel refugees around 19 percent, or 23,970, admitted they had been in jail in Cuba. Of those who had been in prison, 5,486 were political prisoners, while 70 percent of those who had been in prison had been jailed for minor crimes or for acts, such as vagrancy or participation in the extensive black market that were crimes in Cuba but not in the United States. The Cuban Ley de la Peligrosidad (Law of Dangerous Behavior) made some forms of dissent “anti-social” behavior, controlled by prison terms, such as participating in the black market (buying or selling clothes and food); dodging military service or desertion; refusing to work for the state, particularly in the cane fields; and trying to escape Cuba illegally (Bach et al. 1981/82, p. 46). Of those who had been in jail, the immigration service considered only 7 percent to be serious criminals — less than 2 percent of all the Marielitos (Montgomery 1981). Given their youth, the Marielitos clearly constituted a different political generation, one whose coming of age was long after the early revolutionary struggle and sharp social cleavages that demanded enormous sacrifices but also affirmed the loyalty of many. Roughly half of the Mariel immigrants came of age during the late 1960s or the 1970s, when problems of freedom of expression became particularly acute for artists and intellectuals, such as the incident sparked by Heberto Padilla’s poem expressing the marginality of those who were “Fuera del Juego” (“Out of the Game”). Moreover, deviance, particularly homosexuality, was scorned and dealt with by prison sentence. Comparisons with the years of Batista could no longer serve to promote the consent of a generation that scarcely could remember them. The Marielitos, therefore, were a significantly different “vintage” — one whose lived experience (experiencia vivencial, as we say in Spanish) contrasts sharply with other “vintages.” In particular, at the two poles of twenty years of emigration, stand two “vintages” that at best can hardly comprehend one another and at worst may be, as Kunz noted (1973), hostile. Over time the dramatic changes the Cuban revolution effected progressed through distinct stages, and these stages interacted with the social characteristics of those affected to produce markedly different processes of political disaffection. I can now see that they feel no ill will toward me and may even want to help me, but they can’t help me come to grips with the twenty years I’ve spent in Cuba. They don’t understand how I feel… (Llanes 1982, p. 170). Despite the willing help of many in the Cuban community, many others exhibited a defensive prejudice against the newcomers, who might tarnish their reputation. The first and latest waves of Cuban refugees in the United States live side by side but remain aloof from one another. For them, as Kunz (1973, p. 137) pointed out, the date of departure from Cuba “signifies the bona fide” of their “political credo.” Thus, they tend to blame each other for having left too soon or stayed too late. And the Cuba they long for is not quite the same Cuba. Yesterday, by its distance, acquires a happy glow. The peasants look back … and their fancy rejoices in the better days that have passed, when they were on the land and the land was fertile, and they were young and strong, and virtues were fresh. … Alas, those days are gone, that they believed existed, and now there is only the bitter present (Handlin 1973, p. 98). Cuban immigrants in America for many years missed Cuba so. But one night in Key West, while speaking with four refugees from Mariel, the difference struck me. While fishing, they listened on the radio to a baseball game being played right then in their hometown in Cuba. The early refugees’ nostalgia attached them to the Cuba they knew—la Cuba de ayer, before the revolution. The Mariel refugees’ longing was for la Cuba de hoy, of the revolution. The Mariel exodus proved so traumatic, both for the United States and Cuba, that immediately thereafter the doors to further migration closed. However, in the mid 1980s both governments signed a new Migration Agreement that provided for the immigration to the U. S. of up to 20,000 Cubans and up to 3,000 political prisoners a year, as well as for the deportation of excludable Marielitos back to Cuba. However, in actual practice only around 2,000 visas were being given a year. Cuba’s economic crisis reached new depths when communism collapsed in Eastern Europe, particularly in the Soviet Union, on whom Cuba had been enormously dependent for trade and economic subsidies. The impact of these losses has been devastating: a decline in the national product of one half, and in investment by two-thirds from 1989-1993 (Mesa-Lago, 1994). As a result, Cuban industry has been paralyzed, public transport hardly operates, the sugar harvest was abysmally low, and electricity has become sporadic, with Havana suffering blackouts during which people rely on candles, if candles can be found. As Mesa-Lago explained, “because of the eroding value of the peso, health care, education, pensions and other free services -which used to be the pride of the revolution -are rapidly deteriorating.” The economic crisis is so severe that in the Fall of 1990 Castro himself declared it “a special period in a time of peace.” Such a período especial was to have been temporary, but coupled with the United States’ tightening of the embargo (the Torricelli Law) in 1992, the end of the crisis is not in sight. At the same time, the dissident movement has grown and developed into a social movement. Despite different political thrusts (e.g., democratic socialist, environmentalist, Christian democrat), all dissidents in Cuba have increasingly called for a new democratic opening, a liberalization of the political structures that Castro adamantly refuses (See Hidalgo 1994). Hence, both economic and political want now drive the new Cuban emigration, together with the ever present desire for the reunification of families still rent apart. The new Cuban exodus has taken several forms (cf. 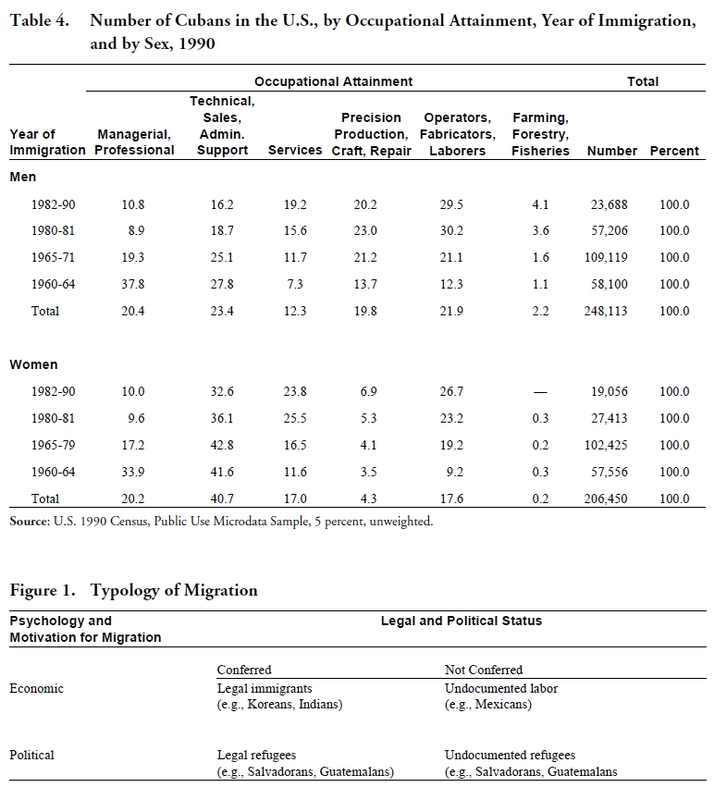 Rodríguez-Chavez 1993), with illegal emigration being the major one. Cubans have become so desperate that they leave on balsas — rafts, tires, or other makeshift vessels— risking death due to starvation, dehydration, drowning, or sharks. The balseros, as they are called, risk the arduous crossing now so regularly that from 1991 on Los Hermanos al Rescate (Brothers to the Rescue) constantly patrol the sea in helicopters searching for them. According to the U. S. Coast Guard, 5,791 balseros managed to reach safety in the United States from 1985 to 1992. As economic conditions worsened in Cuba, the numbers have risen dramatically. While in the year 1989 less than 500 balseros arrived, by 1991 the numbers had risen to over 2,000 and by 1993 to 3,656. In 1994, due to the crisis in August and September, over 37,000 Cubans were rescued at sea. Their gratitude to their rescuers knows no limits. Early one morning in August, Lizbet Martínez, a 12-year old girl with a long, blonde pony tail, climbed aboard a raft with her parents. She took aboard her most prized possession — her violin. When the U. S. Coast Guard rescued them, she played “The Star-Spangled Banner” on her violin for them— a plaintive melody of gratitude for those who had saved her life (Balmaseda 1994a). When the balseros arrive in Florida, they are welcomed— briefly— as heroes. But so many died tragically at sea. Claudia Pérez was 15 months old when she died in her mother’s arms— one hour before she was rescued. Raísa Santana died because she drank seawater, reserving the only drinking water left in their vessel for her son (El Nuevo Herald, 26 December 1993). “Those who despair” constitute this last wave of migration. August 1994 comprised yet another historic turn in Cuba. On August 5th, massive riots took place in the streets of the Center of Havana, in which thousands of Cubans participated all day long, whose behavior expressed the enormous material want that shapes their lives, their disdain for the privilege reserved for Party members and foreigners, and the enormous wish for civil liberties that now also permeates Cuban society (Rivas-Porta 1994). Shortly thereafter, Castro gave orders to the Cuban Coast Guard not to discourage the illegal emigration from Cuba’s shores. Immediately, thousands of balseros put out to sea, in the hopes of reaching Miami. But an abrupt policy change made the Cubans unwelcome. Under orders from President Bill Clinton and Attorney General Janet Reno, the U. S. Coast Guard blocked their progress and directed them to Guantanamo (U. S. base in Cuba), where over 30,000 people lived in tents for the 9 months during which they were allowed entry to the U. S.
As a result of the crisis, a new Migration Agreement was signed in September 1994 that promised that the U. S. will now actually give at least 20,000 visas a year for Cubans to immigrate to the United States. However, in May 1995 another abrupt policy change allowed the refugees in Guantanamo to come to the U. S. at the same time that the United States signed another Migration Agreement with Cuba that stipulated that all balseros found at sea will actually be returned to Cuba. “Cuba bleeds,” headlined Liz Balmaseda (1994b), “and the drops are called rafts.” But the U. S. government now denies their claim to being refugees. The 1953 Cuban Census put the proportion Black at 27 percent. In Cuba, like much of the Caribbean, social class and race overlapped in the extreme. But while the social class level of the Cuban migration dropped, for 15 years the immigrants remained overwhelmingly White. Data from the 1990 census shows that 86.3 percent of the immigrants were White Cubans, 0.2 percent were Black Cubans, 0.3 percent were Asians (no doubt Chinos Cubanos), and 13.2 percent designated themselves as belonging to “other race.” 6 In Cuba, as in the rest of the Caribbean, this usually corresponds to Mulattoes, or Mulaticos, as affectionately called. Charles Wagley (1968) described the social definition of the races in the Americas. In the South of the United States a dual racial classification was used— Black vs. White— that was based on ancestry (“one drop of Black blood”). By contrast, throughout the Caribbean the social definition of race was based on phenotype buttressed by social status—“money bleaches,” the Brazilians say. Moreover, three different racial categories were recognized— Black vs. White vs. those who were mixed, variously referred to as Mulatos (Cuba), Pardos (Brazil), and Trigueños (Puerto Rico). The differential migration of the Cuban races up to this time was quite explainable. Two different social processes, Aguirre concluded, were at work. At the outset, the revolution pulled out the power from under the upper classes, that had deliberately excluded Blacks from their midst. The immigration proceeded through the chain of extended family and friends, further selecting Whites. In addition, the migration policy of the United States and Cuba contributed to Blacks being excluded as they gave priority to close relatives of Cubans already in the United States. Moreover, Blacks in Cuba did benefit from the revolution. Cuba never had a “separate but equal” system of legal segregation; and Cuban culture was a “creolization” of White Spanish and Black African cultural traditions. Yet prerevolutionary Cuba excluded Blacks from the pinnacles of society: yacht and country clubs, the best vacation resorts and beaches, hotels, private schools reserved for the elite. 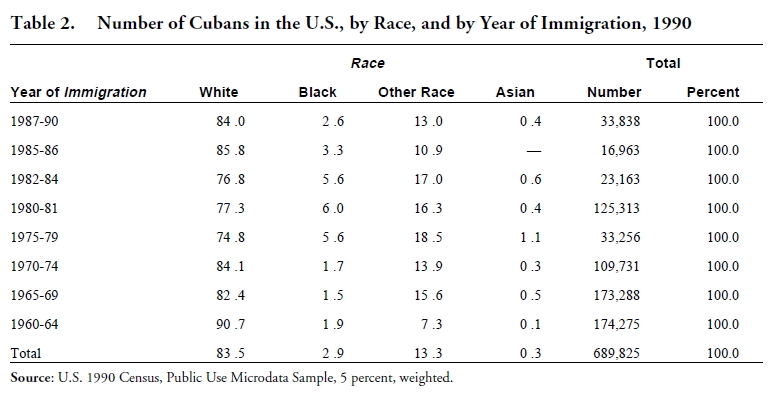 Indeed, as Table 2 shows, about 91 percent of the refugees who came over in the first wave, Cuba’s elite, were White. But the proportion White declined quite markedly during the second wave. From 14 to 19 percent of those who immigrated from 1965-1979 considered themselves as “other.” The Marielitos had the lowest proportion White of any wave, 77 percent, while 16 percent considered themselves “other” (most likely Mulattoes) and 6 percent considered themselves Black. By American standards, fully 22 percent were non-White. Given the Cuban revolution’s appeal to race, why such a large presence in recent years? As early as the seventies, Geoffrey Fox (1971, p. 21) remarked that “almost all those emigrating today are among the poorer classes in Cuba, the very people in whose name the revolution was made,” Blacks included. To study “the defections of the sans-culottes,” Fox interviewed a few workingclass émigrés in Chicago and concluded that both for White and Black workers the salience of race in the revolution created strain— Whites complained of favoritism, Blacks of tokenism. Moreover, although discrimination was eliminated, racial prejudice persisted in Cuba, attitudes which Cuban Blacks might have sensed as real, denying the changes effected. As Max Weber ( 1946, p. 280) pointed to so long ago, whatever their origins, ideas, once established, take on a life of their own and guide action. Whatever role their race may have played in the decision to emigrate, Black Cubans find their steps uncertain in America. As Blacks, they are not fully accepted by Whites; while among Blacks, they are Cubans (cf. Dixon 1988). Looking at other indexes of structural assimilation (cf. Gordon 1964), as one might expect, these racial differences have consequences in America. The 1990 census puts the proportion of all Cubans in the U. S. whose incomes are below the officially defined poverty line as 16.5 percent— a figure that compares quite favorably to that of the total U. S. population. But when we consider Cubans by their race, we can see that while only 14 percent of White Cubans fall below the poverty line, 35 percent of Black Cubans and 23 percent of racially mixed Cubans fall below the poverty line— figures that compare most closely to the poverty rates among Black Americans and Puerto Ricans in the United States. Representations of Cubans as a homogeneous group by social and demographic profiles of the total Cuban-American population mask these dramatic differences. 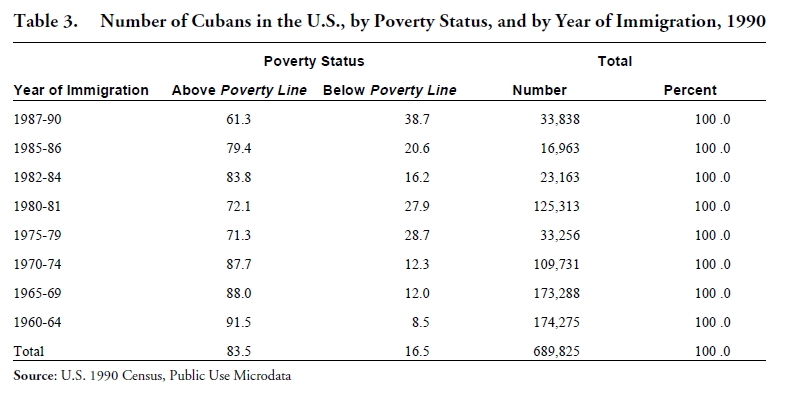 Table 3 shows the proportion of Cubans who are poor in 1990. Among Cuba’s elite and their children who immigrated during the first wave, it is rather negligible: around 8 percent. By and large, this first wave of Cuban migration brought enormous social resources with them — resources of social class, race, education, training, values, and expertise consonant with those of an industrial capitalist society, and the intimate knowledge of American society many had as its closest neighbors to the South. These social resources were “translated,” made valuable in America by the warm welcome they received when they came to the United States— the multifaceted Cuban Refugee Program of assistance (see Pedraza-Bailey 1985). Moreover, at the time of their arrival in the 1960s and early 1970s, substantial economic opportunities existed in the U. S., particularly in Miami. Together, all of these opportunities allowed the development of a Cuban ethnic enclave in Miami (see Portes and Bach 1985; Rieff 1993; Portes and Stepick 1993) and a Cuban “success story” much loved by the American media. By contrast, the poverty rates are much higher in the other waves of Cuban migration, from around 12 percent of those who immigrated during the air bridge (1965-1974) to 28 percent of the Marielitos. These immigrants brought with them far fewer social resources — of social class, race, education, prior knowledge of American institutions and culture. They also arrived when the social context was not propitious — after the assistance provided by the Cuban Refugee Program had ended and when the U.S. was in a serious recession. Among the balseros who arrived most recently, 1987-1990, the proportion poor rises to a dramatic 39 percent. It is unlikely that this is solely due to the recency of their arrival. Time, of course, will tell. That immigration has a decided impact on the labor force participation of women is a recurrent finding of immigration research (Pedraza 1991). It is also a central issue in studies of Cuban immigrants (Pérez 1988; 1986). In contrast to the extremely low rates of labor force participation of women in Cuba prior to the revolution, when most women did not work outside the home, Cuban women who immigrated to the U. S. after the revolution have extremely high rates of labor force participation. Yolanda Prieto’s (1987) study of Cuban women in New Jersey, a more working-class community than Miami, concluded that the major determinant of the massive entrance of these women into the labor force was their social class: these women were middle class either in their origin or, if working-class, in their aspirations. Achieving the upward mobility of the Cuban family in the U. S. made women’s work necessary and broke with the traditional Cuban notion that a woman’s place is in the home, justifying the massive entrance of women into the labor force. Among Cuban immigrants, educational and occupational attainment also vary by waves. Data from the 1990 census show that fully 25 percent of Cubans who immigrated during the first wave had graduated from college, while only 7 percent of the Marielitos had the same level of education. Table 4 shows their occupations. Over a third of the immigrants who came over in the first wave, both men and women, work as managers and professionals, and another very sizeable proportion work in white-collar jobs in sales, technical, and administrative support. Among the Marielitos, the most common occupations were operators, fabricators, and laborers. Next come precision, production, craft, and repair workers for the men (nearly a quarter); and sales, technical, and administrative support for the women (over a third). The occupational insertion of the immigrants from the second wave also shows the uniqueness of the first. Among those who immigrated on the heels of the revolutionary transformation of Cuba, over a third of the immigrants today— as well as then—hold managerial and professional occupations, while among those who immigrated during the period of the air bridge, the proportion of professionals and managers is half that. POLITICAL REFUGEES OR ECONOMIC IMMIGRANTS? Differences abound, yet the questions the recent refugees posed were the same that for over thirty years have framed the debate over the meaning of the Cuban migration. Interpretations of the meaning of the exodus once again polarized into two positions: at one pole, the immigrants were said to be a manifestation of the loss of legitimacy of the Cuban revolution, discrediting it; at the other pole, the immigrants were said to be propelled by the scarcity of consumer goods, merely embarrassing it (see Fernàndez 1982). Hence, at one pole the immigrants were seen as political refugees; at the other, as economic immigrants. Over a million persons for a third of a century: Are they political or economic immigrants? As Figure 1 makes clear, two different axes determine the definition. First, the motivation of the immigrants serves to define them as political or economic immigrants — a sociological distinction. Since all societies are simultaneously and inextricably political and economic, in our perceptions, political and economic conditions are entangled. In a society in transition, political disaffection easily results when government policies to change the basic economic allocation dislocate people: they lose their economic, social, and ideological “place.” Even in a stable society, lack of economic opportunities easily results in lack of trust for public leaders. In this sense, Cuba’s refugees are, and have always been, both political and economic. But when people grow politically disaffected, when they lose faith and trust in their government and its cause, they can no longer be disposed of as simply economic immigrants. Cuba’s refugees are, and have always been, fundamentally political. Second, the governments that regulate their exit and arrival define immigrants as political or economic immigrants— a legal distinction (see Pedraza-Bailey 1985). At one end, in the United States, Haitian refugees have consistently encountered a hostile reception: the refusal to grant them amnesty, their interdiction at sea, and their deportation back to Haiti despite the political violence that reigned there. Haitians who were refused asylum can be seen as undocumented refugees. Until now, Cubans had always been recognized and welcomed as refugees. But during this last crisis, for the first time they were defined as aliens attempting to enter the United States by illegal means. With the end of the Cold War and under the resurgence of nativistic attitudes across the land, Cubans have now become undocumented refugees. At the other end, in Cuba, over the course of time, all who left were labeled traitors and counterrevolutionaries, whether they were supporters of the ancien régime of Batista or, like Hùber Matos, had fought against Batista in the hills of the Sierra Maestra, side by side with Fidel Castro for a nationalist and social-democratic revolution they felt Castro’s espousal of communism had betrayed (cf. Zolberg et al. 1989). A society where the only choice possible is to “love it or leave it” provides too few choices. A truly democratic society is defined not only by its party structure, constitution, delegation of authority, or electoral representation, but principally by its capacity to tolerate and incorporate dissent. The Cuban exodus, now over a third of a century old, has been driven not only by the trauma of revolutionary change in Cuba, and by the economic hardships caused both by the inefficiencies of the new economic system as well as by the isolation of the trade embargo, but also by Cuba’s incapacity to tolerate dissent. The Cuban revolution’s only solution to dissent has been to externalize it. Cuba has yet to provide political channels to express and incorporate the other dissenting voices. Over the time span of the exodus, over a third of a century, Cubans in the United States have been undergoing a profound attitudinal transition: from refugees to immigrants to ethnics. The first part of this transition in attitudes “from refugees to immigrants” has, under the impact of constant new immigration and the centrality of Cuba in the lives of the immigrants, been slow to take place (cf. Rieff 1993). But to the degree that Cubans have ceased to look backwards (like Lot’s wife) to Cuba as the only source for the meaning of their existence and identity, to the degree that they have started to look forward and to carve their future in this country as Cuban Americans, to that degree it has been achieved (cf. Portes 1984). The second part of this transition in attitudes, “from immigrants to ethnics” is more inexorable because it corresponds to the demographic transition presently underway. Although quite young still, a second generation born in this country is now in our midst that was raised under American institutions and socialized in American schools, the great transmitters of tradition, culture, and values. Although these young Cubans’ assimilation may have been delayed by their growing up in the Cuban enclave in Miami, like any people, they are the soil in which they rooted and grew. Moreover, they lack the felt sense of a Cuba they did not know. In “The Agony of Exile,” Rubén G. Rumbaut (1991) underscored that the meaning of exile is different across generations. To the parents’ generation, who made the decision to leave, exile represents a profound loss and a profound commitment, both. And it entails a worldview that will be defended. By contrast, to their children’s generation, exile is an inherited circumstance. Typically, they are in solidarity with the family’s predicament, but do not need to protect their parents’ worldview. Their focus is on the future in the new society. In between these two lies the “1.5 generation”— those who left at the dawn of their adolescence and, like Robert Park’s (1928) “marginal man,” are forever caught between two worlds, the land of their birth and the land that tended them. As one of them, it is my hope that the second generation that has now rooted in the United States will not be so American that they will lose touch with their history and culture, with their Cubanía. But as a sociologist I have to recognize that such may well be the price to be paid for shedding the pain of exile. Aguirre, Benigno E. 1976. “The Differential Migration of Cuban Social Races.” Latin American Research Review 11: 103-24. Alfonso, Pablo M. 1984. Cuba, Castro, y los Católicos. Miami, Florida: Ediciones Hispamerican Books. Amaro, Nelson, and Alejandro Portes. 1972. “Una Sociología del Exilio: Situación de los Grupos Cubanos en los Estados Unidos.” Aportes 23: 6-24. Amaro Victoria, Nelson. 1977. “Mass and Class in the Origins of the Cuban Revolution.” Pp.tion.” International Migration Review 17: 95-119. Dixon, Heriberto. 1988. “Black Cubans in the United States: A Case of Conflicts between Race and Ethnicity.” Paper presented at the Annual Meeting of the American Studies Association, Miami, Florida, October 27-30. Domínguez, Jorge I. 1991. “Cooperating with the Enemy? U. S. Immigration Policies toward Cuba.” Harvard University, Center for International Affairs. Bach, Robert L., Jennifer B. Bach, and Timothy Triplett. l981/l982. “The Flotilla ‘Entrants’: Latest and Most Controversial.” Cuban Studies 11/ 12: 29-48.
. 1980. “The New Cuban Immigrants: Their Background and Prospects.” Monthly Labor Review 103: 39-46. Balmaseda, Liz. 1994a. “Balserita Violinista Toca pero También Escribe como los Angeles.” El Nuevo Herald, 19 Octubre.
. 1994b. “Cuba Bleeds, and the Drops are Called Rafts.” The Miami Herald, 17 August. Casal, Lourdes. 1979. “Cubans in the United States: their Impact on U.S.-Cuban Relations.” Pp. 109-36 in Revolutionary Cuba in the World Arena, edited by Martin Weinstein. Philadelphia: Ishi. “Cifra Anual de Balseros Cubanos Marcó Récord.” 1993. El Nuevo Herald, 26 Diciembre. Clark, Juan M. 1975. “The Exodus from Revolutionary Cuba (1959-1974): A Sociological Analysis.” Ph.D. dissertation, University of Florida. gración Cubana. Areíto 1: 4-5. Fagen, Richard R., Richard A. Brody, and Thomas J. O’Leary. 1968. Cubans in Exile: Disaffection and the Revolution. Palo Alto, California: Stanford University Press. Feagin, Joe R. 1978. Racial and Ethnic Relations. Englewood Cliffs, N. J.: Prentice Hall. Fernàndez, Gastón. 1982. “The Freedom Flotilla: A Legitimacy Crisis of Cuban Socialism?” Journal of Interamerican Studies and World Affairs 24: 183-209. Ferree, Myra Max. 1979. “Employment without Liberation: Cuban Women in the United States.” Social Science Quarterly 60: 35-50. Gordon, Milton M. 1964. Assimilation in American Life. New York: Oxford University Press. Handlin, Oscar. 1973. The Uprooted. Boston: Little, Brown. Hidalgo, Ariel. 1994. Disidencia. Miami: Ediciones Universal. Institute of Cuban Studies. 1982. Itinerario Ideológico: Antología de Lourdes Casal. Miami, Fl. : Ediciones Diáspora. Theory.” International Migration Review 15: 42-51.
. 1973. “The Refugee in Flight: Kinetic Models and Forms of Displacement.” International Migration Review 7: 125-46. Lee, Everett S. 1966. “A Theory of Migration.” Demography 3: 47-57. Llanes, José. 1982. Cuban-Americans: Masters of Survival. Cambridge, Mass. : ABT. Mannheim, Karl. 1952. Essays in the Sociology of Knowledge. New York: Oxford University Press. Martí, José. 1891. “Nuestra América.” Revista Ilustrada de Nueva York, 1ro. de Enero. Mesa-Lago, Carmelo. 1994. “Will Cuba’s Economic Reforms Work?” The Miami Herald, 2 January.
. 1978. Cuba in the 1970s: Pragmatism and Institutionalization. Albuquerque: University of New Mexico Press. Mills, C. Wright. 1961. The Sociological Imagination. Montgomery, Paul L. 1981. “For Cuban Refugees, Promise of U. S. Fades.” The New York Times, 19 April. Onís, Juan de. 1954. The America of José Martí. New York: Minerva Press. Park, Robert Ezra. 1928. “Human Migration and the Marginal Man.” American Journal of Sociology 33: 881-93. Pedraza, Silvia. 1991. “Women and Migration: The Social Consequences of Gender.” Annual Review of Sociology 17: 303-25. Pedraza-Bailey, Silvia. 1985. Political and Economic Migrants in America: Cubans and Mexicans. Austin: University of Texas Press. Pérez, Lisandro. 1988. “Cuban Women in the U. S. Labor Force: A Comment.” Cuban Studies 18: 159-64.
ment and Family Organization: The Cuban Success Story Reexamined.” International Migration Review 20: 4-20. Portes, Alejandro, and Alex Stepick. 1993. City on the Edge: The Transformation of Miami. Berkeley: University of California Press. , and Robert L. Bach. 1985. Latin Journey: Cuban and Mexican Immigrants in the United States. University of California Press.
. 1984. “The Rise of Ethnicity: Determinants of Ethnic Perceptions among Cuban Exiles in the United States.” American Sociological Review 49: 383-97.
, Juan M. Clark, and Robert L. Bach. 1977. “The New Wave: A Statistical Profile of Recent Cuban Exiles to the United States.” Cuban Studies 7: 1-32. Prieto, Yolanda. 1987. “Cuban Women in the U. S. Labor Force: Perspectives on the Nature of the Change.” Cuban Studies 17: 73-94. Rieff, David. 1993. The Exile: Cuba in the Heart of Miami. New York: Simon & Schuster. Rivas-Porta, Guillermo. 1994. “El Pueblo Cubano: Protagonista, Víctima, y Espectador.” Desafíos 1 (Agosto/Septiembre): 4-5. Roca, Sergio. 1977. “Cuban Economic Policy in the 1970s: The Trodden Paths.” Pp. 83-118 in Cuban Communism, edited by Irving Louis Horowitz. New Brunswick, N. J.: Transaction. Rodríguez-Chavez, Ernesto. 1993. “Tendencias Actuales del Flujo Migratorio Cubano.” Cuadernos de Nuestra América 10: 114-37. Rose, Peter I. 1981. “Some Thoughts about Refugees and the Descendants of Theseus.” International Migration Review 15: 8-15. Jean Athey. Baltimore: Johns Hopkins University Press. Schreiber, Anna P. 1973. “Economic Coercion as an Instrument of Foreign Policy: U. S. Economic Measures against Cuba and the Dominican Republic.” World Politics 25: 387-413. Stein, Barry N. 1981. “The Refugee Experience: Defining the Parameters of a Field of Study.” International Migration Review 15: 320-30. Tabori, Paul. 1972. The Anatomy of Exile. London: Harrap. Thomas, Hugh. 1977. The Cuban Revolution. New York: Harper & Row. Thomas, John F. 1967. “Cuban Refugees in the United States.” International Migration Review 2: 46-57. American Tradition, edited by Charles Wagley. New York: Columbia University Press. Walsh, Bryan O. 1971. “Cuban Refugee Children.” Journal of Inter-American Studies and World Affairs 13: 378-415. Weber, Max. 1946. “The Social Psychology of World Religions.” Pp. 267-301 in From Max Weber: Essays in Sociology, edited by H. H. Gerth and C. Wright Mills. New York: Oxford University Press. Zeitlin, Maurice. 1966. “Political Generations in the Cuban Working Class.” American Journal of Sociology 71: 493-508. Zolberg, Aristide R., Astri Suhrke, and Sergio Aguayo. 1989. Escape From Violence: Conflict and the Refugee Crisis in the Developing World. New York: Oxford University Press.